Do you want a better solution than a drywall ceiling? Install USG™ ceilings that are both affordable and offer high performance. They provide acoustical dampening, insulation, and indoor aesthetic solutions for residential and commercial customers. In addition, USG manufactures products that are moisture and mold resistant, eco-friendly, and fire resistant. Control sound between rooms, within a space, or throughout your entire building. Studies show that quieter work environments enhance human interactions, learning, and healing. By installing USG ceiling systems, you'll have a happier home, more productive employees, and a more comfortable environment. These systems also create a better atmosphere for clients and customers. The products are measured by a noise reduction coefficient (NRC). Number one represents perfect absorption, and number zero indicates perfect reflection. How Do USG Ceiling Tiles Work? Drywall can only do so much to dampen sound. However, USG creates products that are ideal for noise reduction. In addition, the actual design of their products, not just the materials used, provides the acoustical dampening that is so important. For instance, holes, dimples, and other indentations in the tiles control the sound level of a room. Even though they seem small, they effectively absorb sound waves, creating a quieter environment. When sound waves hit the acoustical tiles, they enter the holes and tiny cracks where they are absorbed. 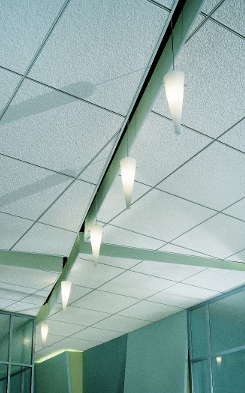 Some of USG ceiling tiles provide as much as 80 percent noise reduction. The sound dampening properties depend upon the density and design of the ceiling tile you want. Designers of USG products consider the dynamics of sound and create products that are perfect for any number of environments. From office and schools to hospitals, warehouses, and residential properties, USG ceilings are appropriate in a wide variety of settings. Allow our team at Couser Supply Inc. to select a system that provides the right sound control to ensure the result you want. Some customers need sound reduction from office to office while others require sound dampening through an entire space. USG ceiling systems ensure a quieter environment, improve privacy, and reduce distractions created by noise. Since poor indoor acoustics negatively affect a person's comfort level, it makes sense to install an acoustic ceiling if you live or work in noisy environment. Depend on us to determine a USG ceiling product that suits your needs. USG offers many products that work well in commercial, residential, or industrial settings. Contact us to schedule a consultation when you're considering the best acoustic ceiling for your business. We proudly serve clients throughout the United States.